Police officers were caught on video commending their own use of force in an arrest that turned an innocent man into a felon after he was beaten by police. Police officers in Tulsa, Oklahoma, were caught on video commending each other on their use of force in the arrest of a suspect—but the man they put in handcuffs was an innocent man they beat to a bloody pulp, after trespassing on his property. Now, he is the one facing criminal charges. 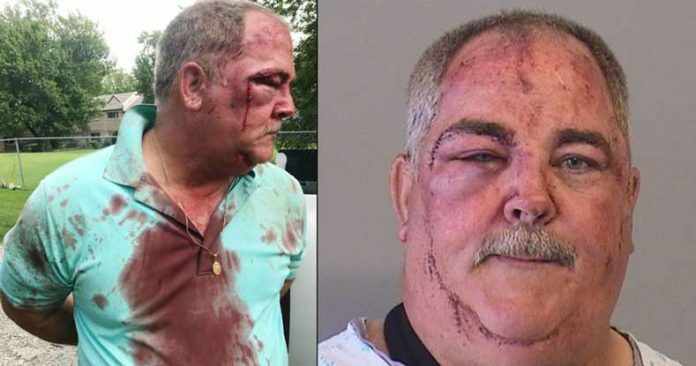 Jack Morris, a 53-year-old man from Tulsa, is charged with a felony count of assault and battery on a police officer, and misdemeanor complaints of assault on an officer, obstruction and resisting an officer. When Morris was brought to jail on Aug. 16, his face was bloodied and swollen, his shirt was covered in blood, and he was eventually taken to an Emergency Room, where he received nine stitches and was treated for a broken arm. However, there are still questions as to how Morris became a police suspect in the first place. According to a report from the Tulsa World, the Tulsa Police Department recently responded to an open records request by releasing 14 videos that gave insight into the events surrounding the arrest. While video evidence of the physical altercation was not included, the comments the officers made in the aftermath were included. At the time, Officers Joshua Dupler and Anthony First were responding to reports of a stolen vehicle. They were searching for two suspects, and they claimed they entered Morris’ property on the suspicion that one of the suspects was hiding in his barn. Morris told the Tulsa World that he received a call from his neighbors about the officers’ presence on his property, and he drove out to the field to check on one of his horses. Once he got there, the officers told him that he was not allowed to go near his horses and he needed to leave. According to the officers’ reports of the encounter, Morris responded to their commands by balling his fists, squaring his shoulders and yelling, “Take me to jail, motherf—kers.” However, Morris claims that he made no attempts to assault any of the officers on the scene, and said they were ones who assaulted him. Despite the fact that the officers’ use of force—which included an abundance of pepper spray and physical strikes—sent Morris to the hospital, Dupler commented on what an excellent job they did. “Like literally, it was just a good [use of force]. You sprayed him. We got him in custody. He’s probably still gonna try to sue us just because he’s an asshat and he’s got money,” he said. As The Free Thought Project has reported, Tulsa Police have come under fire for a number of incidents, including reports of collusion among officers intending to steal guns and cash from citizens. Morris pleaded not guilty to the charges at his arraignment, and his preliminary hearing is scheduled for Sept. 25.